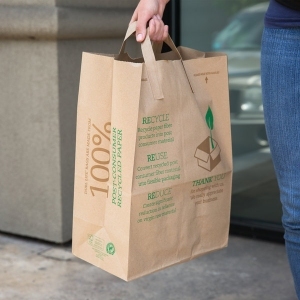 AF&PA pointed out that taxing paper carryout bags is a regressive move that wrongfully penalizes a product that is recyclable, easily processed at municipal recovery facilities, compostable, made of recycled material and reusable. Paper is the most-recycled material in the U.S. today. According to the Environmental Protection Agency, more paper (by weight) is recovered for recycling from municipal solid waste streams than glass, plastic and aluminum combined. Paper recycling extends the useful life of fiber, keeps paper out of landfills, is widely accessible and reduces greenhouse gas emissions. The American Forest & Paper Association (AF&PA) serves to advance a sustainable U.S. pulp, paper, packaging, tissue and wood products manufacturing industry through fact-based public policy and marketplace advocacy. AF&PA member companies make products essential for everyday life from renewable and recyclable resources and are committed to continuous improvement through the industry's sustainability initiative— Better Practices, Better Planet 2020. The forest products industry accounts for approximately four percent of the total U.S. manufacturing GDP, manufactures nearly $300 billion in products annually and employs approximately 950,000 men and women. The industry meets a payroll of approximately $55 billion annually and is among the top 10 manufacturing sector employers in 45 states. Visit AF&PA online at www.afandpa.org or follow us on Twitter @ForestandPaper.